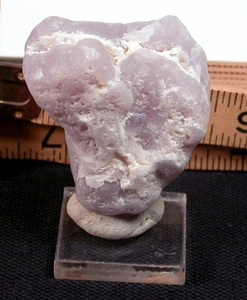 11/16x 1-3/4x 2" tall, a doubly-layered naturally heart-shaped rare, naturally etched botryoidal yttrium fluorite miniature from Colorado to you. Translucent with a soft, smooth feel - a captivating gift. Brown's Canyon District, Colorado, USA - limited supply.